Despite late Hamburg action and some visits in Berlin, I posted nothing here for a while, because I was on vacation. We rolled off to the Baltic Coast, starting out from Lübeck. Like Hamburg, Lübeck was a city of the old-time Hanseatic League, but the most westerly one, which was not part of the communist east Germany. The old city is rather small. It was ferociously bombed during the world war. The Marienkirche was deliberately destroyed in the last months of 1945, as revenge for the Luftwaffe's destruction of the cathedral in Coventry. Now the old gabled buildings of Lübeck have been lovingly reconstructed, and the city is rich again. Just outside the old city is the Lübeck Alternative, a small grandfathered squat center which began in 1978. (I have the book, but haven't read it.) Behind the group of buildings is a Bauwagenplatz, an encampment of trailers for living. The Alternative is right across the street from a giant ugly new convention center, making for a curious juxtaposition. On one side of the road, punk concerts and a grungy bar. Across the street when we visited, a beer company was sponsoring a festival with bland entertainment and local restaurants offering “tastes” for many Euros. Out of Lübeck we journeyed eastward along the coast, Wismar, Stralsund, Greifswald, Wolgast – Hansa League cities all, except for the last, part of the old Pomeranian duchy. (Their lead coffins have been returned to the church crypt in a new installation.) Many gabled roofs, half-timbered houses, fat straw roofs, and many many vacation rooms. Tourism seems the main industry now along the coast, that and making smoked fish. The tourists are nearly all Germans. Unless you speak the language, you can have a hard time. Along the road on Rügen island we passed an abandoned dance hall, a mssive weathered gray edifice from socialist days. There are abandoned buildings along the coast – especially those beside the railroad. (The new Alternative is in one of these.) But I saw no evidence of any occupation action, and only one political sticker on the whole trip, one warning of talking to the police. That tiny shred of political evidence was balanced by a nazi graffiti on a medieval tombstone stuck into the wall of the Kloster ruin, a site made famous by Caspar David Friedrich's paintings. There is road- and trainside graffiti, big letter work, maybe by one or two vacationing artists. Otherwise, not even any evidence of alternative culture. (“Live jazz” once a week at a town cafe no longer counts.) The Baltic coast of eastern Germany seems a desert in this respect, but who knows what is hiding in the cracks? Driving through Greifswald we spied a clutch of punks on the street. The town is no tourist mecca, and there were a good number of abandoned buildings. We didn't stop. Could that be the punk Baltic? Inquire in Lübeck. 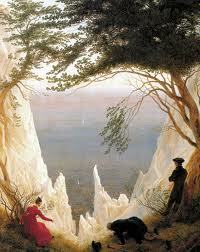 Caspar David Friedrich also made Hiddensee island famous with his early 19th century painting of the striking steep chalk cliffs, one of the first tourist postcards. That view, now clogged by trees, is today the site of a multimedia nature show. We visited Ahrenshoop, on Hiddensee island, touted for its history as a former artists' colony and resort of famous modernist authors and thinkers. Now it is mostly a massive encampment of resort hotels crammed together on a narrow spit of land. The art colony is sporadically evoked, mainly by galleries alternately schlocky and craftsy. (An interesting project, a “museum box” investigating the island's cultural history, is run by a school and was closed for the summer.) How many “sleepy fishing villages” became artists' colonies, and thereafter massive modern resorts? When artists arrive rural working people should shiver in their boots. We fetched up in Ahlbeck for a couple days, a classic old-style Baltic coast beach resort town with all the trimmings: Long pier, cabanas for rent, horse and buggy rides, and garish sea palace hotels, all that – but no artistic pretensions. In our hotel I dreamed of a squatted social center called Squat Anya. In this fantasy I was being shown around by a guy who led me up tottering stairs in the back of the place past piles of sodden paint chips which had flaked off the walls. The front rooms were still dry, with dusty décor left over from a gala party. One banner read, “Making Revolution” with paper cutouts of 18th century soldiers. Another read “Taking Revolution,” hung over abandoned buffet tables. A girl told me that was where they held their VoKu, or weekly free meals. I suppose in dreaming this that I was thinking about the seaside resorts in the U.S. south that have appropriated revolutionary iconography as décor. Here in the former DDR (socialist east Germany, ended in 1989) I have no idea how folks relate to their pasts. Almost no one speaks English and my German is rudimentary. Ahlbeck is mostly old folks and families. A less hip place is hard to imagine. Occasional outbreaks of kitsch that make rural Georgia look modernist add to the claustrophobia. My sense of the place – and somehow I took it as exemplary of the whole coast – is that the people are overwhelmingly conservative. We watched the reactionary Frenchman Jean Le Pen on Pomeranian German TV making a visit to Japan. He went to a shrine associated with the Japanese military which even government ministers avoid. Le Pen may be old and doddering, but his venom is fresh. Even without translation it leaks through the TV to corrode the comfortable furnishing of contemporary liberalism, by vociferously honoring the defeated forces of a militant genocidal imperialism. But how is this kind of defeat internalized if it is always repressed, always kept out of public view? In the east of Germany first fascism and then communism fell – the first violently, amidst unimaginable ruin, and the second quietly, but leaving behind complex remnants. Does “Ostalgia” – fond feelings for a vanished egalitarian albeit relentlessly repressive regime – translate into any grounds for new forms of contemporary resistance to hyper-capitalism?